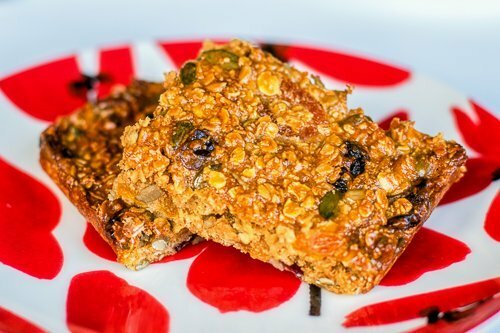 Packed with dried fruit and seeds, these flapjacks are just delicious and full of fibre and nutrients. You can make them gluten-free by using gluten-free oats. Preheat oven to 180C, 350F, or Gas Mark 4. Grease and line a 18 x 28cm baking tin with baking parchment. In a large saucepan, melt the butter and sugar together over a low heat. Add the condensed milk and golden syrup, then remove from the heat and stir in the oats, dried fruit and 50g of each of the seeds. Mix well, then press into the prepared baking tin, and sprinkle over the remaining seeds and lightly press in. Bake for 25 – 35 minutes, until golden. Allow to cool in the tin, then cut into pieces before serving. Makes 12 large bars or 24 bite size pieces.